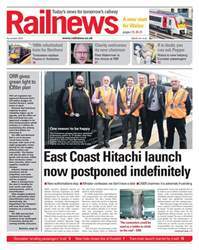 THE long-awaited launch of Intercity Expresses on the East Coast Main Line has been postponed indefinitely while efforts to deal with safety matters continue. 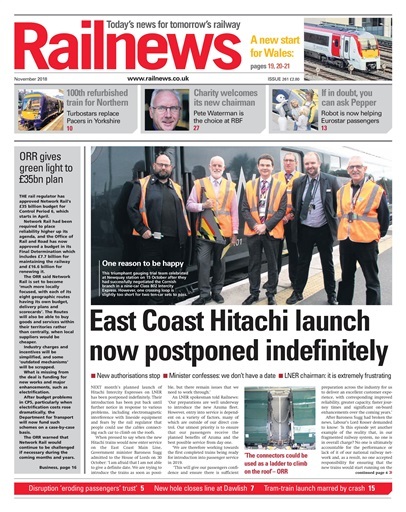 The front page story in Railnews for November reports that electromagnetic interference is still a problem, while the regulator is concerned that cables connecting each car could be used as a ‘ladder’ to the roof of the trains. Transport for London has borrowed £350 million from the Department for Transport to complete the Elizabeth Line, which is now unlikely to open through central London until autumn next year. The project’s CEO is also leaving later this month. Industrial action is set to continue until the end of the year, and disruption caused by repeated strikes is ‘eroding trust’ among passengers, according to watchdog Transport Focus. Resilience of vulnerable stretches of railway is also in the news: a Devon MP voiced a protest after a hole nearly two metres wide and deep appeared under the Great Western line at Teignmouth, following a high tide. A different kind of threat is posed by autumn leaves, and Network Rail said it expected to deal with 50 million of them this year, with ‘leaf busting’ trains running in many areas. Network Rail itself can now go forward into Control Period 6 in April, after the Office of Rail and Road approved its £35 billion budget for 2019-2024. This month’s feature looks at the new era which is dawning in Wales after the franchise changeover, while Hot Topic discusses whether full-scale railway privatisation can realistically remain on the agenda. Gulls feature in this month’s Railnews, because they have been pecking holes in the roof of a Manchester station. We reveal what Network Rail is doing to encourage these vandals to fly elsewhere. This, and much more, is in Railnews for November.